Full Size 8' Long Bed Full Extension (FE) 10-9648-FE 96"L x 48"W 1,000 lbs. FE with Xtreme side Rails 10-9648-FE-XT 96"L x 48"W 1,000 lbs. Full Extension (FE) 20-9648-FE 96"L x 48"W 2,000 lbs. FE with Xtreme side Rails 20-9648-FE-XT 96"L x 48"W 2,000 lbs. Full Size 6.5' Short Bed Full Extension (FE) 10-7548-FE 75"L x 48"W 1,000 lbs. FE with Xtreme side Rails 10-7548-FE-XT 75"L x 48"W 1,000 lbs. Full Extension (FE) 20-7548-FE 75"L x 48"W 2,000 lbs. FE with Xtreme side Rails 20-7548-FE-XT 75"L x 48"W 2,000 lbs. 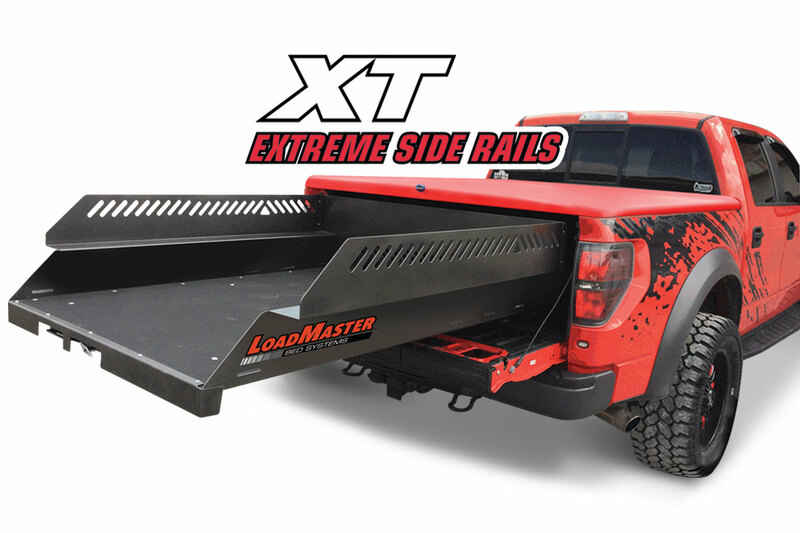 Full Size Super Duty 6'9" Short Bed Full Extension (FE) 10-8048-FE 80"L x 48"W 1,000 lbs. FE with Xtreme side Rails 10-8048-FE-XT 80"L x 48"W 1,000 lbs. Full Extension (FE) 20-8048-FE 80"L x 48"W 2,000 lbs. FE with Xtreme side Rails 20-8048-FE-XT 80"L x 48"W 2,000 lbs. Full Size 5.5' & 5.8' Short Bed Full Extension (FE) 10-6548-FE 65"L x 48"W 1,000 lbs. FE with Xtreme side Rails 10-6548-FE-XT 65"L x 48"W 1,000 lbs. Full Extension (FE) 20-6548-FE 65"L x 48"W 2,000 lbs. FE with Xtreme side Rails 20-6548-FE-XT 65"L x 48"W 2,000 lbs. 2015-c F150 5.5 & Tundra Crew Max Full Extension (FE) 10-6348-FE 63"L x 48"W 1,000 lbs. FE with Xtreme side Rails 10-6348-FE-XT 63"L x 48"W 1,000 lbs. Full Extension (FE) 20-6348-FE 63"L x 48"W 2,000 lbs. FE with Xtreme side Rails 20-6348-FE-XT 63"L x 48"W 2,000 lbs. Midsize 6' Short Bed Full Extension (FE) 10-7141-FE 71"L x 41"W 1,000 lbs. FE with Xtreme side Rails 10-7141-FE-XT 71"L x 41"W 1,000 lbs. Full Extension (FE) 20-7141-FE 71"L x 41"W 2,000 lbs. FE with Xtreme side Rails 20-7141-FE-XT 71"L x 41"W 2,000 lbs. Midsize 5' Short Bed Full Extension (FE) 10-5941-FE 59"L x 41"W 1,000 lbs. FE with Xtreme side Rails 10-5941-FE-XT 59"L x 41"W 1,000 lbs. Full Extension (FE) 20-5941-FE 59"L x 41"W 2,000 lbs. FE with Xtreme side Rails 20-5941-FE-XT 59"L x 41"W 2,000 lbs. Midsize 5' Short Bed Frontier Full Extension (FE) 10-5641-FE 59"L x 41"W 1,000 lbs. FE with Xtreme side Rails 10-5641-FE-XT 59"L x 41"W 1,000 lbs. Full Extension (FE) 20-5641-FE 59"L x 41"W 2,000 lbs. FE with Xtreme side Rails 20-5641-FE-XT 59"L x 41"W 2,000 lbs.